I'm taking off on a magical trip today. With my parents. In my parents' trailer. To see my sister play in a quidditch tournament. You can pick your punchline for this one. I've yet to see this trailer, but if you want a visual, it's an MPG 181. Here's the back story: my dad has been talking about buying a trailer for at least a decade. He always talked about buying a trailer and traveling the country. My mom would either roll her eyes, or whisper to us that we needed to buy big houses so that she could come stay with us. She always assumed this was just one of those things that would never happen. Then, about two years ago, my dad bought a pick up truck capable of hauling a trailer. Then things got real. My dad retired this summer and bought the trailer about a month later. I'm looking forward to this trip, even though when my mom invited me, I asked her where I would sleep. She told me the kitchen table turns into another bed, which was met with silence. Needless to say, Tim isn't attending. My mother called me last night to say "Enjoy sleeping in your bed tonight, because tomorrow, you're sleeping on the kitchen table. Don't plan on sleeping in, either, because we need that table to have breakfast." I have been promised smores. There better be a lot of smores. 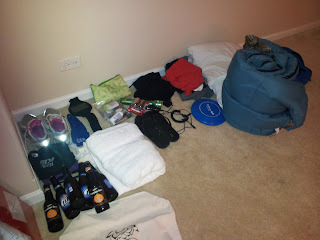 In order to get ready for this trip, I had to pack: running clothes, running shoes, flip flops, a towel, toiletries, make up, clothes, a flash light, sleeping bag, pillow, pajamas, cell phone chargers (in case I need to call the nearest Holiday Inn) a frisbee and beer. Because beer will be needed.